Although most existing health care systems that integrate primary care with behavioral health or oral care share similar terminology and structures, there is not one nationally recommended model for care integration. Integrated care models perhaps can be implemented even more successfully in rural settings due to commonalities found in rural practices, noted Rachel J Valleley, PhD, a licensed psychologist and professor at the University of Nebraska Medical Center. “In rural areas, integrated care magnifies the benefits for patients, physicians and behavioral health providers by improving access to care for patients, providing a referral source for busy rural practices and a consistent referral stream for behavioral health providers,” Valleley said. The SAMHSA-HRSA Center for Integrated Health Solutions strongly encourages healthcare integration, defining integration as “a systematic coordination of general and behavioral healthcare.” The Center notes that integrated behavioral care can occur within primary care settings, behavioral care settings or within health homes. The Maine Health Access Foundation (MeHAF) encourages integration partners to develop collaborative models individualized to meet their community’s needs. MeHAF Senior Program Officer Becky Boober said key elements that partners are asked to keep at the forefront are: patient choice in the care setting, patient and family participation in service development, collaboration between physical and behavioral health providers who share common patient medical records, and solution-focused, cost-effective treatment for physical and behavioral conditions. MeHAF grantees assess patient and community needs and develop their models accordingly. To continue integrated learning and implementation, MeHAF funds support services such as the Integrated Care Training Academy and the Learning Community. Patient-Family Advisory Councils meld providers with patients and family members to share ideas that improve care delivery and patient satisfaction. As providers see the positive results, Boober said initial hesitancy has diminished and partners are going beyond their internal organizations to consult with other entities committed to developing best practice integration models. Oral care integration with primary care has not yet been as widely adopted as behavioral health integration, but is still evolving. According to the report, Returning the Mouth to the Body, there are four general models for oral care integration—full integration, colocation, primary care provider service focus and collaboration—and that no one approach should be considered the “gold standard.” The Oral Health Toolkit on the Rural Health Information Hub website describes an Oral Health-Primary Care Integration Model and lists strategies that rural communities are using to integrate oral health and primary care, which include referral partnerships between dental clinics and primary care practitioners, and school-based models for dental assessment. “Some Health Centers locate oral health team members, such as a dentist or dental hygienist, in the primary care setting,” said Irene Hilton, DDS, MPH, dental consultant for the National Network for Oral Health Access (NNOHA). “Depending on state practice regulations, these dental providers may conduct oral health screenings, exams, deliver preventive procedures and make referrals to the dental department. These efforts build positive, collaborative relationships between the medical and dental departments. The process is bi-directional with dental staff able to send patients with high blood pressure readings or potential uncontrolled diabetes directly to medical for same day assessment. In addition to screening for high blood pressure and diabetes, some Health Center dental programs conduct rapid HIV testing and follow-up during the dental appointment.” NNOHA advocates also for a Patient-Centered Health Home that offers integrated medical and dental services as one of the solutions to limited oral care access. HRSA has supported the Association of American Medical Colleges developing a curriculum for medical students on oral health, as well as the American Academy of Pediatrics – Oral Health Quality Improvement Module. HRSA currently is sponsoring a pilot project (IPOHCC) with NNOHA to implement the core set of oral health clinical competencies for non-dental health care professionals in the Community Health Center setting. 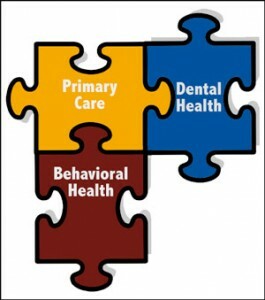 In addition, HRSA’s Oral Health IT Toolbox (no longer available online) promotes the integration of oral health primary care through health IT, which allows multiple providers to connect and share information that could be relevant and valuable to the provision of care, across multiple settings. The Institute of Medicine* has called for integrating oral health care into overall health care, to be accomplished, in part, by non-dental health care professionals taking a role in oral health care, and for primary care providers to educate individuals about how to prevent oral diseases, to assess risk and screen for oral diseases, and to deliver preventive services. The Smiles for Life, a national web-based and interactive oral health curriculum, aims to enhance the role of primary care clinicians in the promotion of oral health for all age groups. Recently, the American Dental Association teamed up with the National Association of Community Health Centers to increase awareness and integration of oral and primary care. Mental health and substance use disorder services are one of the 10 essential benefits that will be covered under the Affordable Care Act (ACA); dental care is also one of the essential benefits, but that benefit is restricted to children. According to SAMHSA, primary and behavioral health care integration is an opportunity under the ACA to improve health care quality through the systematic coordination of primary and behavioral healthcare. Because provisions within ACA provide incentives for integrating behavioral health and primary care, providers are prioritizing behavioral health as a primary integration effort. The ACA also provided for grants to school-based health centers and includes oral health services in qualified services to be provided at those centers. “The new healthcare laws are written with the understanding of treating people more holistically and focusing on integrated care to accomplish that,” Bridges said. This entry was posted in Features and tagged Behavioral health, Care coordination, Dental workforce, Health screening, Healthcare workforce, Integrated service delivery, Maine, Mental health, Nebraska, Oral health, Primary care, Service delivery models on November 18, 2013 by Rural Health Information Hub.